We are beyond excited to announce the introduction of the Orion Music + More Festival, a brand new festival that we, your friends in Metallica, will be the headliners, curators, and instigators of. After many years of playing at legendary festivals around the world including Reading, Roskilde, Werchter, Rock Im Ring, Rock In Rio, Lollapalooza and countless others, we're hoping to spread the good times and diverse musical feel here in the States and bring the amazing good vibes and spirit of our 30th anniversary celebration at the Fillmore Theatre in December to a larger, outdoor setting. We've got two nights of live 'Tallica mixed with all kinds of cool bands, activities and stuff to see wrapped into one incredible weekend planned for you. And for the only time in America this year, we're planning to continue the 'Black Album' anniversary celebration by playing it in its entirety on one night AND something we've never done before... drum roll please... all of 'Ride the Lightning' on the other! If you had a chance to watch the live webcast, you know now that our location will be Bader Field in the heart of Atlantic City, New Jersey on the East Coast on June 23 and 24, 2012. We've joined forces with our friends at C3, who bring you Lollapalooza and Austin City Limits each year here in the U.S. as well as presenting Big Day Out to our Australian friends. Together we've invited a wide range of bands and musicians to play on multiple stages (at least three!) including Arctic Monkeys, Avenged Sevenfold, Modest Mouse, The Gaslight Anthem, Cage The Elephant, Fucked Up, Best Coast, Hot Snakes, Titus Andronicus, Gary Clark Jr., Lucero, Roky Erickson, The Black Angels, The Sword, Liturgy, and more to be announced in the coming weeks. We've also put together non-music activities for you to experience when you take a break between sets... hopefully a chance for you to interact with us and see some of the stuff we're into. Weekend tickets go on sale SOON! Met Club members should log in for details on their pre-sale with discounted tickets and special packages that begins on Wednesday, February 8 at 7:00 AM PST and ends on Friday, February 10 at 7:00 PM PST. Tickets will be available for everyone starting Saturday, February 11 at 7:00 AM PST... all the details are here: www.orionmusicandmore.com. The entire weekend ticket is $150 with no service charges... what you see is what you get for ticket prices with no surprises. Needless to say, the details will keep flowing... keep watching here and the Orion site for ongoing updates. "Beyond Magnetic" EP in stores now! 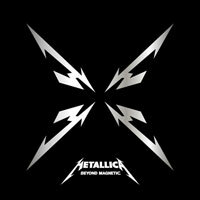 Metallica release their Beyond Magnetic EP today on a CD, available since last December as a digital download. Please make sure to pick it up at your favorite retail store. 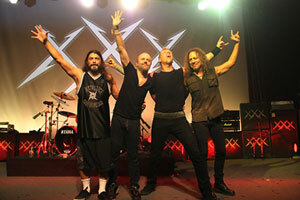 Next year looks promising on the metallicamp with more European Vacation tour dates and what it seems couple of shows to keep on celebrating this anniversary according to Lars.